Popular Daybreak Model,New HVAC and Furnace! This home features an open great room floor plan w/ split bedrooms plus a den. The kitchen boasts Beautiful Corian counters, stainless sink, Upgraded cabinetry w/ pull-out shelves, built-in microwave plus all appliances stay. Custom built-in entertainment center, Large Master Bedroom with Bay Window, Master Bath has his and her sinks. Kitchen has a Large Dining area with Bay Window. Ceiling fans, Recessed Lighting. Beautiful Wood Flooring in the Great Room, Master and Den. Tiled Kitchen and in all other traffic area's. 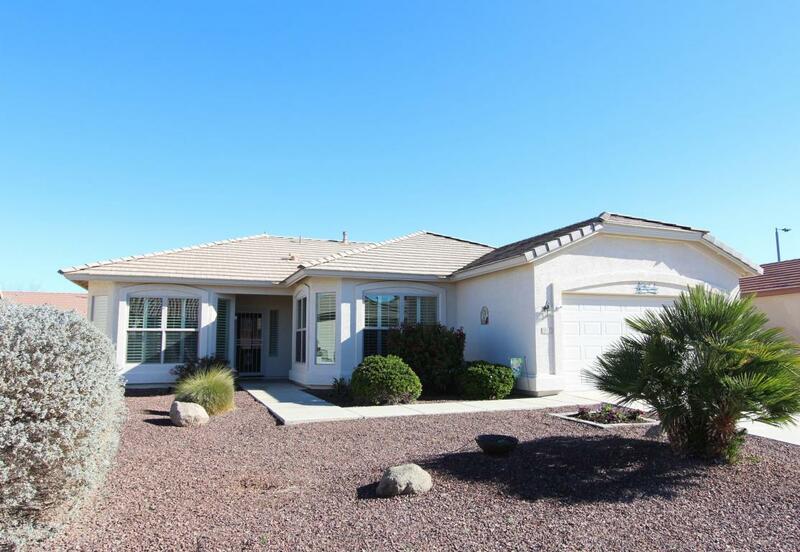 Back yard features large covered patio, fully enclosed back w/ block wall for privacy. Solera Offers many activities, Including, golf, tennis, ceramics, play pool, lap pool, work out center and more!